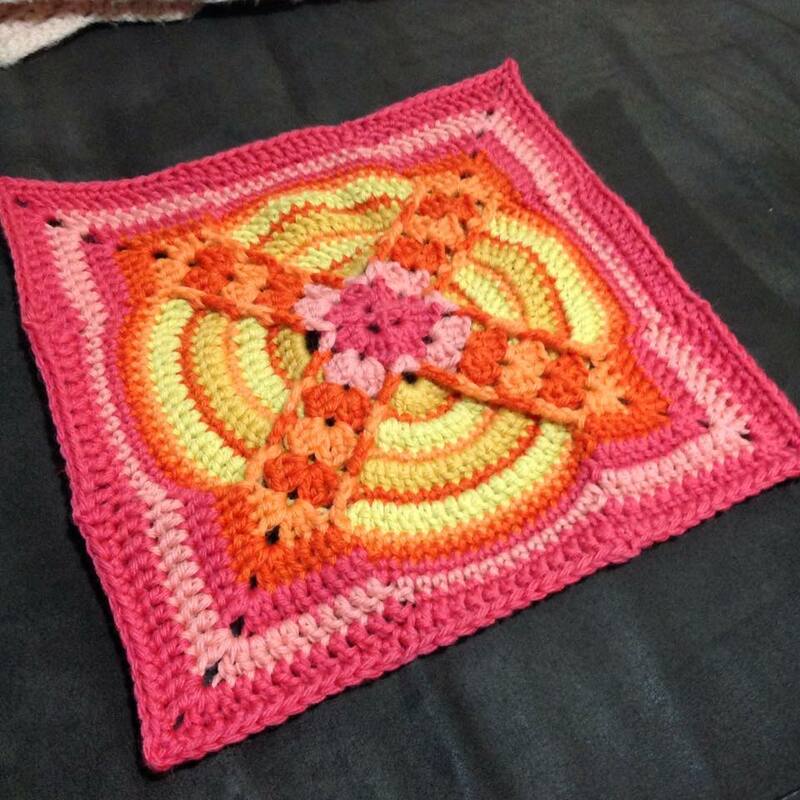 There is nothing worse than spending the whole time you are crocheting worrying about something else that you should really be doing instead. Now that my exams are finished (YAAAAAAY!) 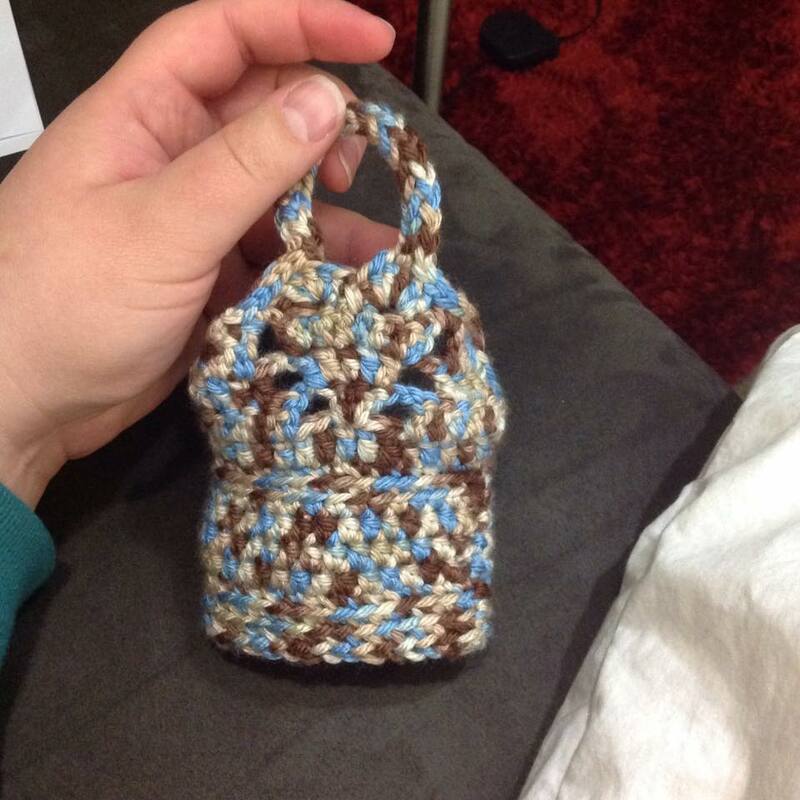 I have six months of guilt-free crochet ahead of me, and man it feels good! 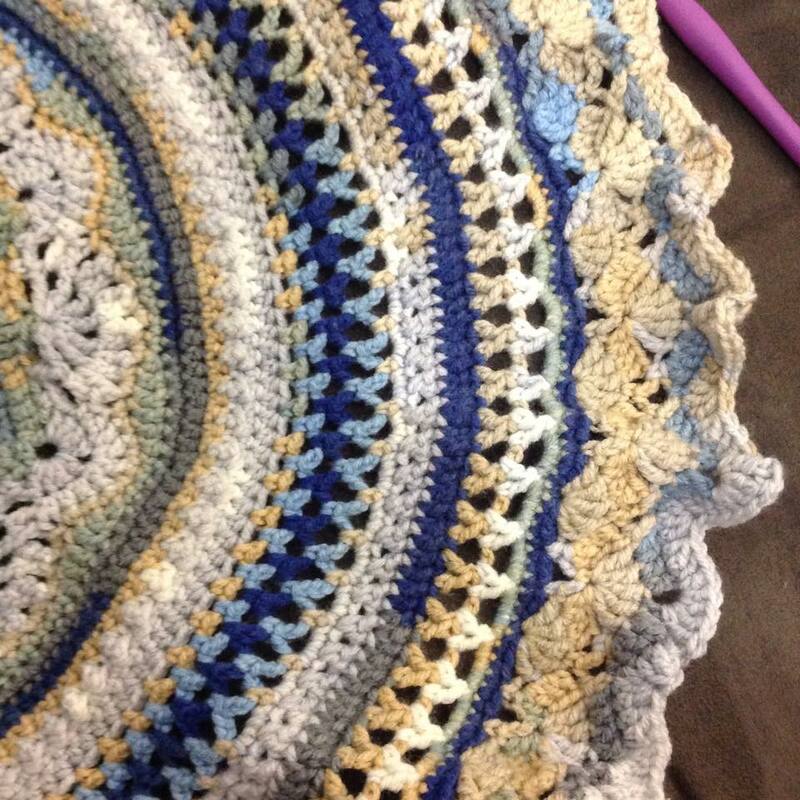 This weekend I put a thing dark purple border around my Summer CAL blanket, and blocked it again. 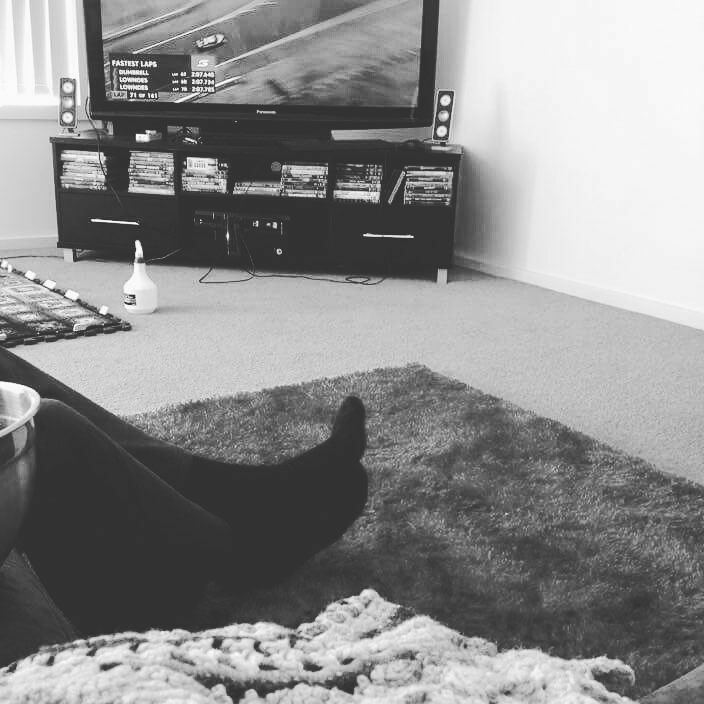 My dad saw it yesterday when he came over to watch the Bathurst 1000, and has told me to enter it into the Royal Hobart Show along with my Sophie’s Universe Blanket. I’m still undecided. Going by the reactions of friends and family, I suspect the Summer CAL may have a better chance at placing than my poor Sophie (which I love more). 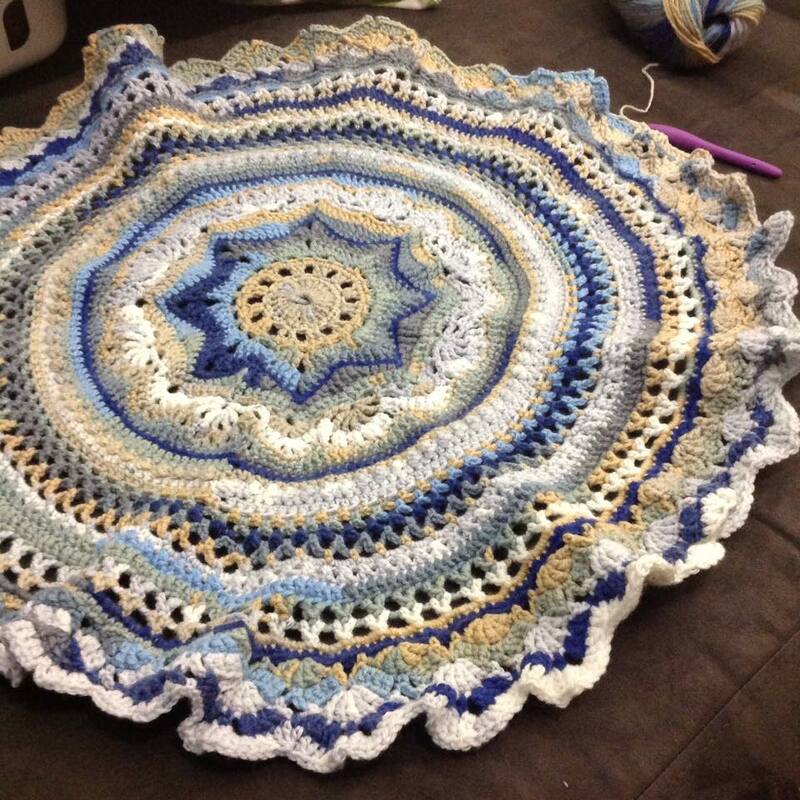 I think it’s liked better simply because of the dramatic colour changes, while my Sophie is more subtle and intricate. I have just under a week to decide, so we shall see! 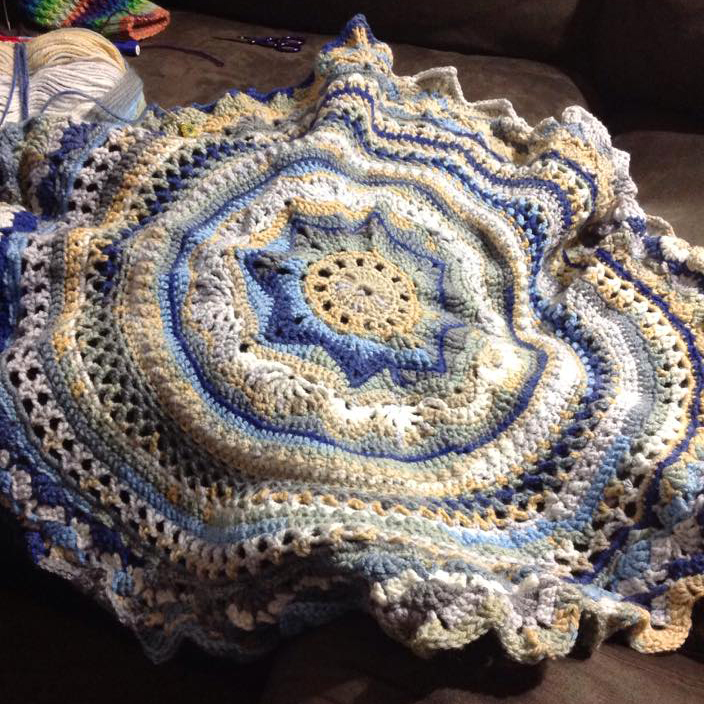 Now that I’ve officially finished the Summer CAL blanket, I decided to get my Rings of Change WIP out of the cupboard and work on that for a bit. It may sound strange but I’ve missed working with a 4mm hook, and since I’m using varigated yarn there are hardly any pesky ends to weave in. Nice and straightforward. I like it. While I was on the mainland for a week reveling in the glorious shorts-and-t-shirt weather, I wasn’t exactly on holidays. 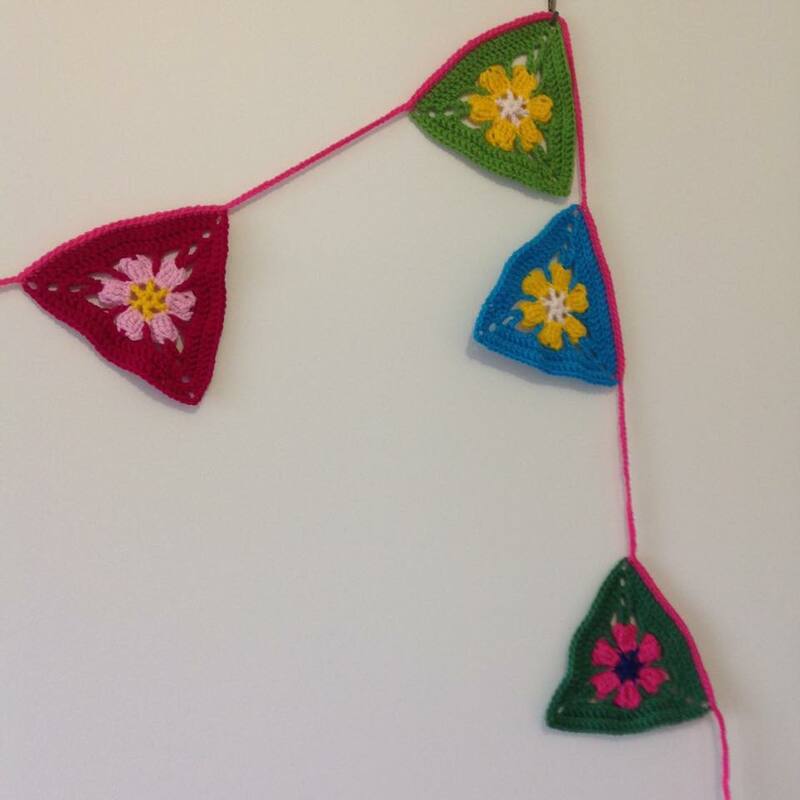 I had a university residential (I’m an external student, so these lovely things are mandatory) which was so full on that I’m pretty sure my brain hasn’t fully recovered from over-stimulation yet. 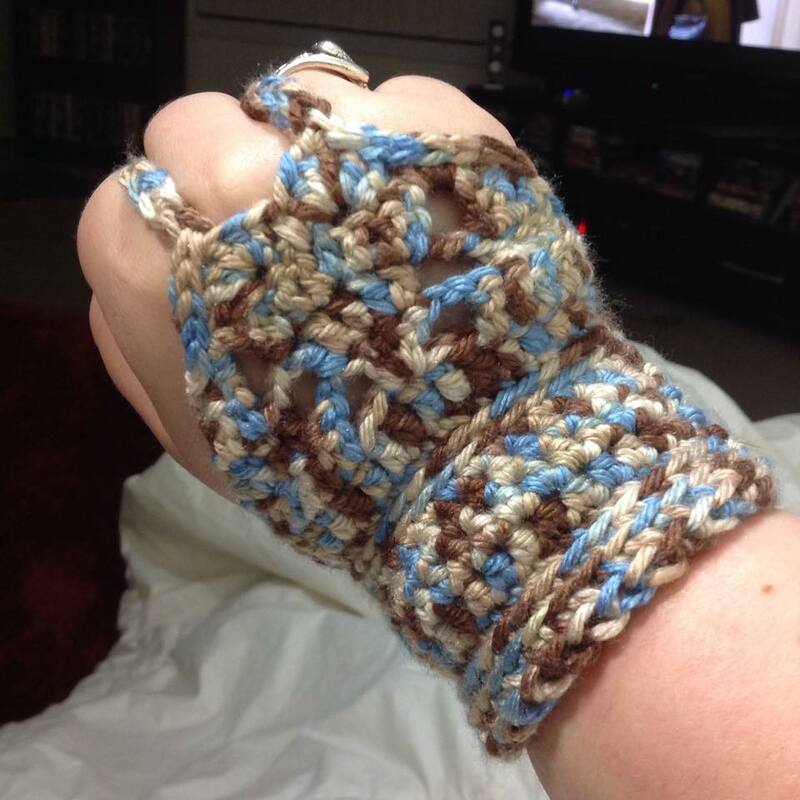 I had these massive days, and then got to go back to the college and watch Netflix on my laptop and crochet. 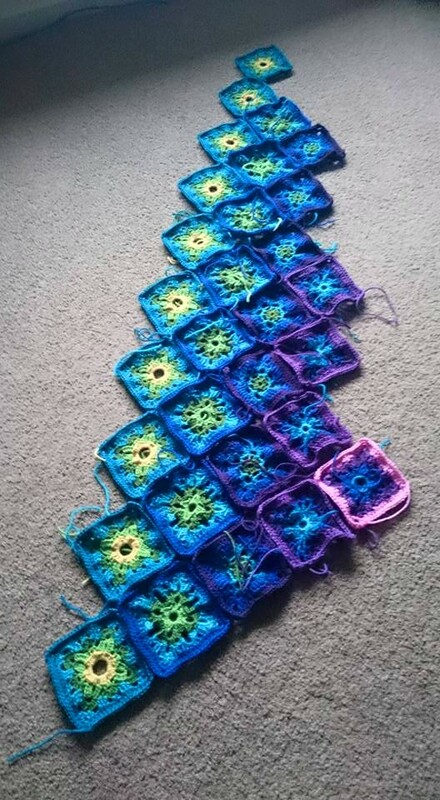 During one of my more enthusiastic crochet moments a couple of months ago, I made up a bundle of cute triangle blocks in various bright acrylic colours, in order to make a blanket for my stepdaughter’s room. 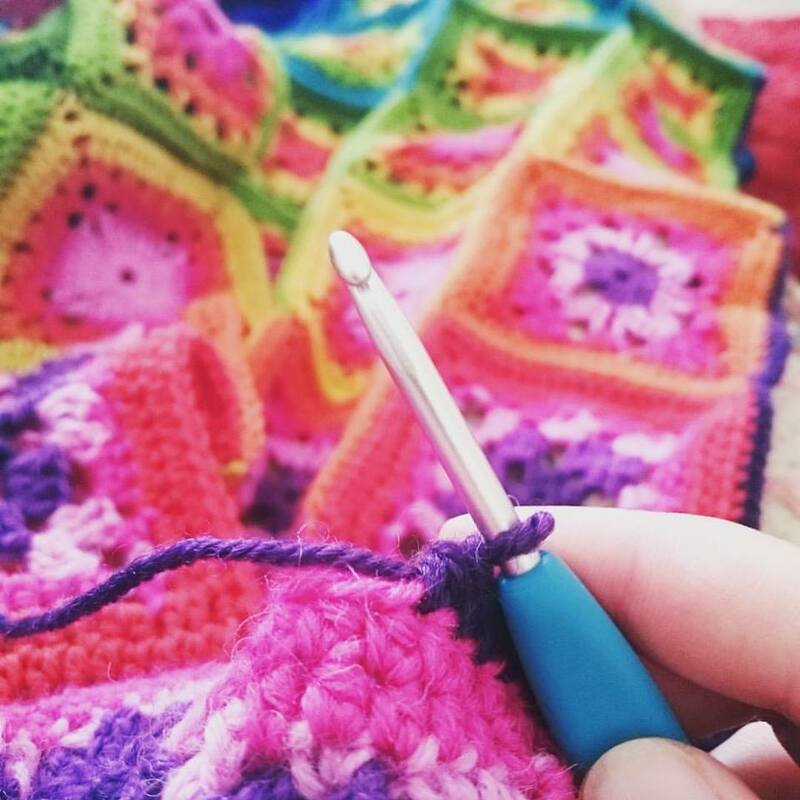 Unfortunately over those few months it seems I have indeed become a yarn yuppie, and crocheting in that much crappy acrylic makes my heart hurt! 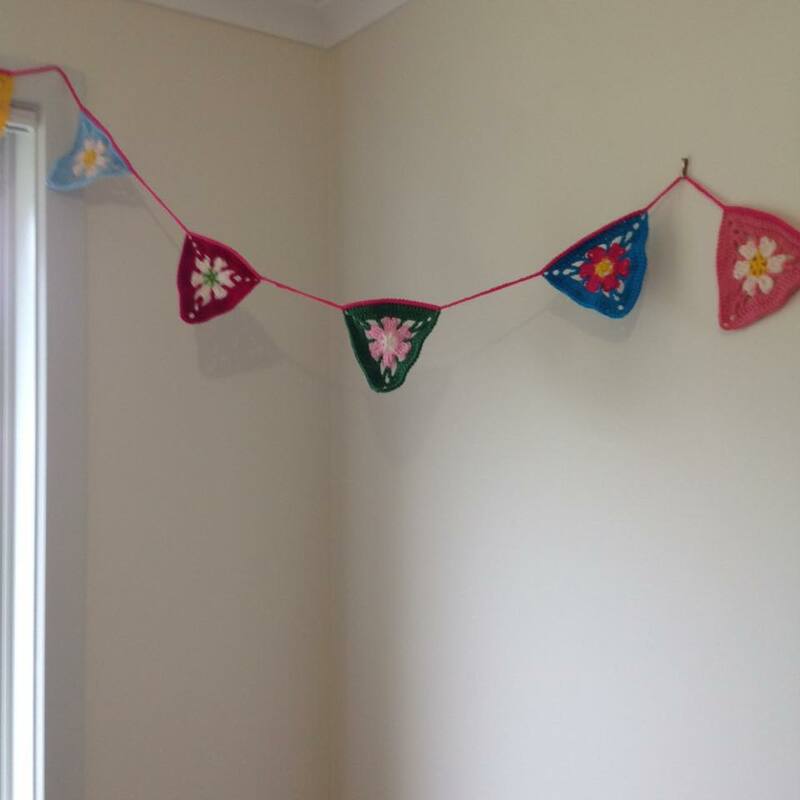 So I spent one evening this week making bunting out of the blocks, and I finally put it up in my stepdaughter’s room today. I’m so happy with it! 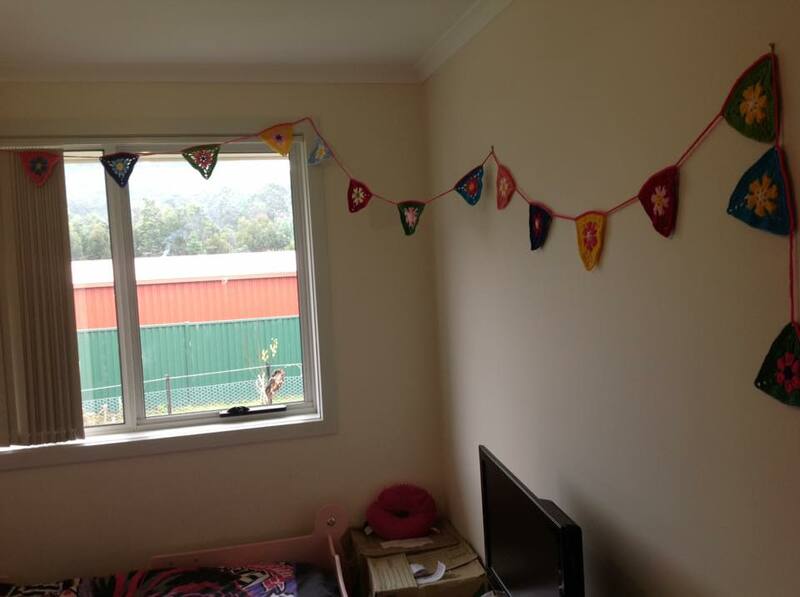 It makes the room so much brighter and I hope Jade loves it too. 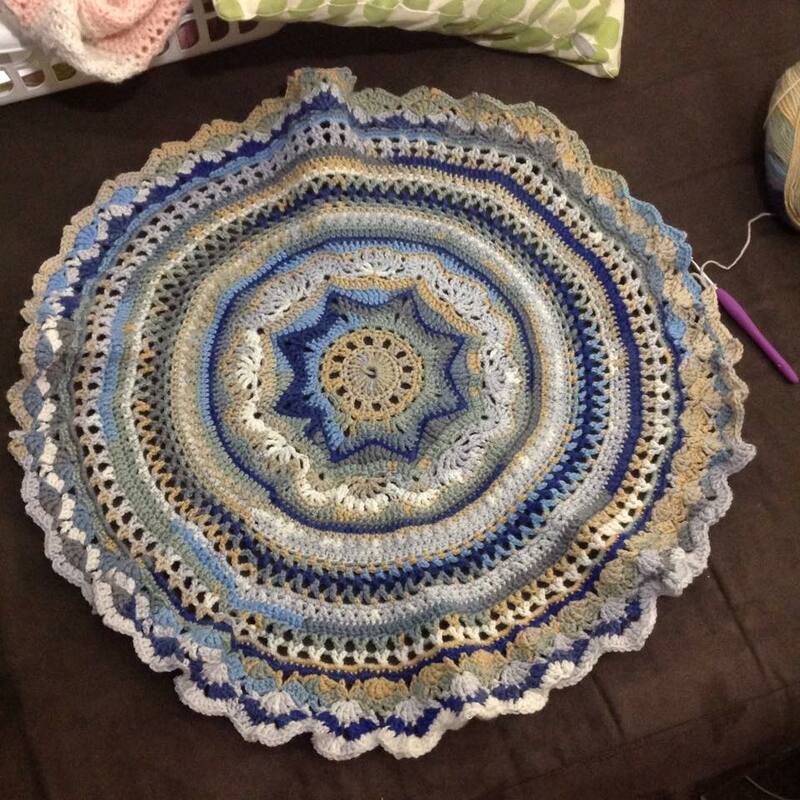 This is my second attempt at the Rings of Change blanket pattern – the first one is lovely too but I had heaps of this Ice Yarn Magic Light yarn to use and thought this was the best pattern to use it with! 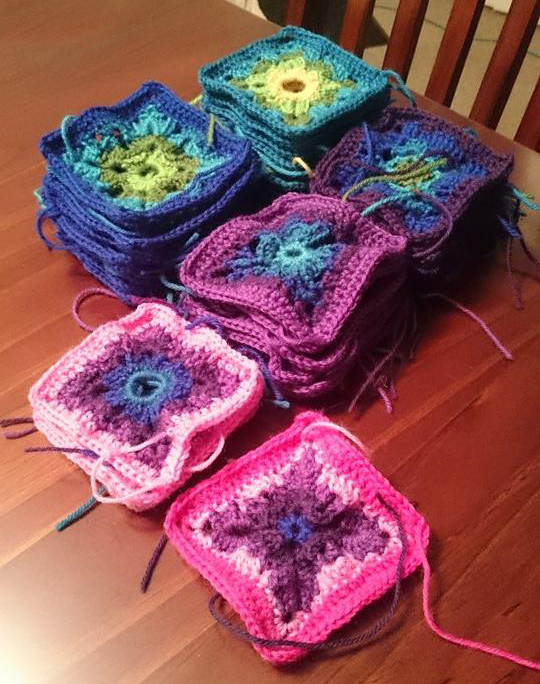 I’m loving the way the yarn works up, with all its variegated goodness. 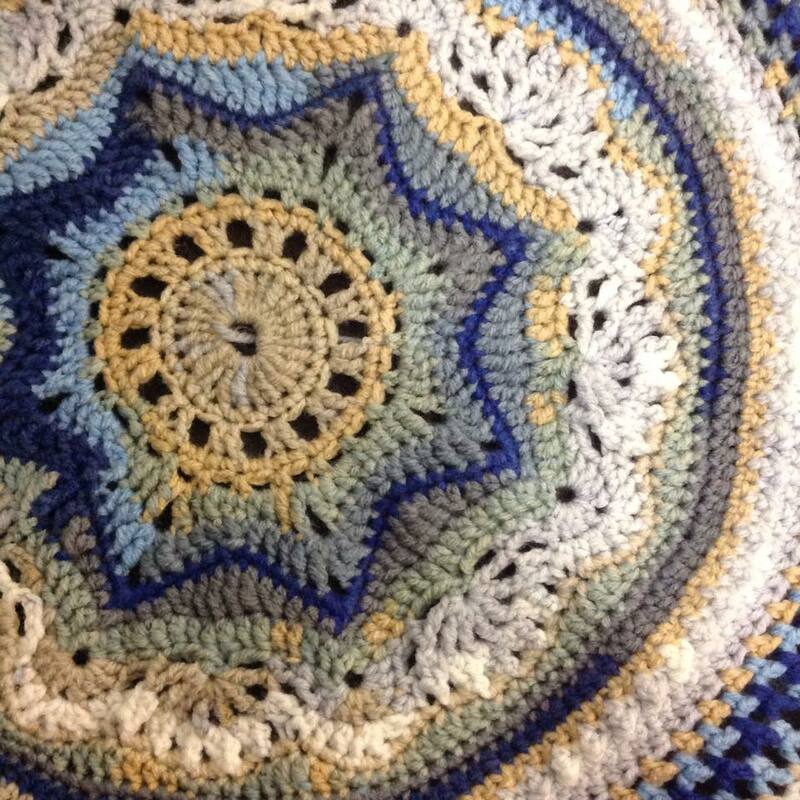 It’s been a while since I last posted; over the last coupe of weeks I’ve been playing around with a few patterns, a few new yarns, and trying to latch my interest on to something now that I’ve finished the Sophie’s Universe CAL. 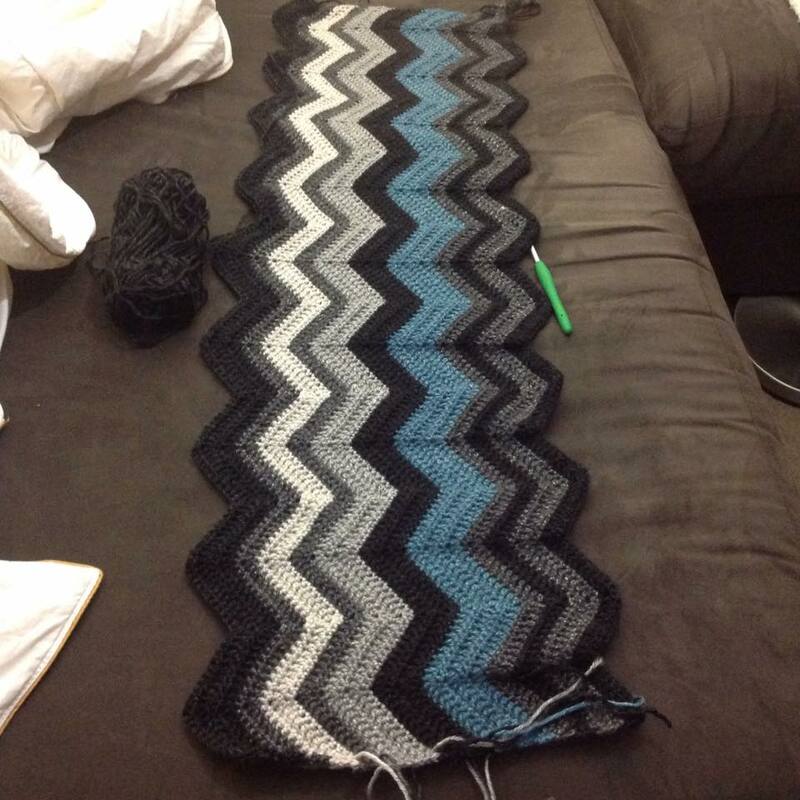 So at the moment I’m working on a delicate shawl using varigated 4 ply cotton (images to come in the next few days) and a manghan (an afghan for my other half) in a chevron pattern, using Lionbrand Heartland yarn, in nice manly colours! 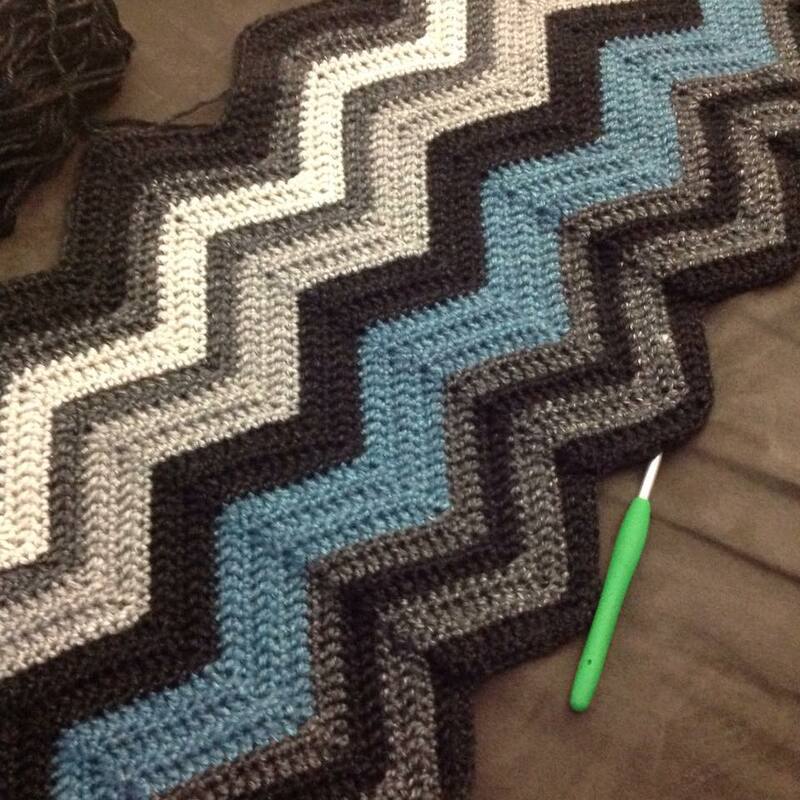 The chevron pattern is simple, but for someone who uses her brain a lot during the day at work, it’s nice to be able to do something monotonous with my hands in the evenings while watching TV.